To analyze the effect of substrate concentration on the activity of enzymes. Enzymes are protein molecules that act as biological catalysts by increasing the rate of reactions without changing the overall process. They are long chain amino acids bound together by peptide bonds. Enzymes are seen in all living cells and controlling the metabolic processes in which they converted nutrients into energy and new cells. Enzymes also help in the breakdown of food materials into its simplest form. The reactants of enzyme catalyzed reactions are termed as substrates. Each enzyme is quite specific in character, acting on a particular substrates to produce a particular products. The central approach for studying the mechanism of an enzyme-catalyzed reaction is to determine the rate of the reaction and its changes in response with the changes in parameters such as substrate concentration, enzyme concentration, pH, temperature etc .This is known as enzyme kinetics. One of the important parameters affecting the rate of a reaction catalyzed by an enzyme is the substrate concentration, [S]. 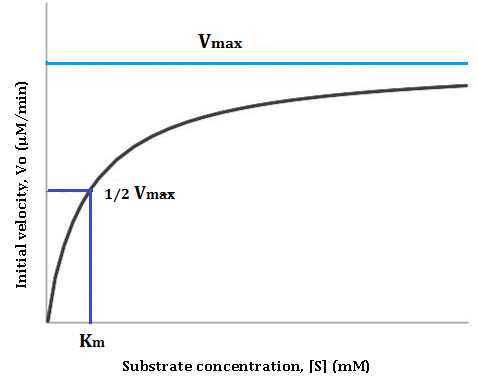 During enzyme substrate reaction, the initial velocity V0 gradually increases with increasing concentration of the substrate. Finally a point is reached, beyond which the increase in V0 will not depend on the [S]. When we plot a graph with substrate concentration on the X axis and corresponding velocity on Y axis. It can be observed from the graph that as the concentration of the substrate increases, there is a corresponding increase in the V0. However beyond a particular substrate concentration, the velocity remains constant without any further increase. This maximum velocity of an enzyme catalysed reaction under substrate saturation is called the Vmax , Maximum velocity. The necessary terms in this reaction are [S], V0, Vmax, and Km (Michaelis constant),. All these terms can be measured experimentally. In 1934, Lineweaver and Burke made a simple mathematical alteration in the process by plotting a double inverse of substrate concentration and reaction rate. For enzymes obeying the Michaelis-Menten relationship, the “double reciprocal” of the V0 versus [S] from the first graph,(fig1) yields a straight line (Fig. 2). The slope of this straight line is KM /Vmax, which has an intercept of 1/Vmax on the 1/V0 axis, and an intercept of -1/KM on the 1/[S] axis. The double-reciprocal presentation, also called a Lineweaver-Burk plot. The main advantage of Lineweaver-Burk plot is to determine the Vmax more accurately, which can only be approximated from a simple graph of V0 versus [S] (Fig 1). Adapted from David L. Nelson, Michael M. Cox , Lehninger principles of biochemistry, 4th edition. The enzyme α Amylase can catalyze the hydrolysis of internal α -1,4-glycosidic bond present in starch with the production of reducing sugars. In the study of substrate concentration on enzyme kinetics, the enzyme is kept constant where as the concentration of Starch is taken in increasing order. As the substrate concentration increases, the amount of products produced in every successive tube also increases. This was explained by Michealis and others that an enzyme catalyzed reaction at varying substrate concentrations is diphasic i.e. at low substrate concentration the active sites on molecules (enzyme) are not occupied by substrate and the enzyme rate varies with substrate molecules concentration (phase1). As the number of substrate molecules increases, the enzyme attains the saturation level, since there is no more reaction sites remaining for binding. So the enzyme can work with full capacity and its reaction rate is independent of substrate concentration. (Phase II). This Enzyme – substrate reaction can be determined by measuring the increase in reducing sugars using the 3, 5 Dinitro salycilic acid reagent. In an alkaline condition, the pale yellow colored the 3, 5- dinitro salicylic acid undergo reduction to yield orange colored 3- amino -5-nitrosalicylic acid. The absorbance of resultant solutions is read at 540nm. The intensity of color depends on the concentration of reducing sugars produced.